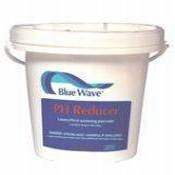 This product lowers both pH and total alkalinity in your swimming pool or spa water. This product is safer to use than muriatic acid. The active ingredient in this granular chemical is Sodium Bisulfate. Use when pH level rises above 7.6. Dosage rates vary based upon swimming pool volume and current pH and alkalinity levels. Normal use is 6 ounces per 10,000 gallons.